What was the Miller-Urey Synthesis experiment? In 1953, American chemist and biologist Stanley Lloyd Miller (1930–2007) and American physical chemist Harold Clayton Urey (1893–1981) designed an experiment—called the Miller-Urey Synthesis—to understand the conditions on early Earth and to test the Oparin-Haldane hypothesis. 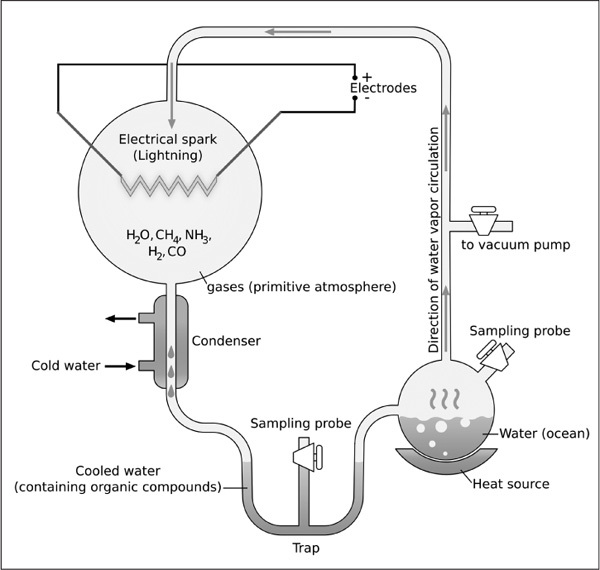 Simulating what was thought to be the atmospheric conditions on Earth about four billion years ago—a hot environment filled with simple organic chemical substances such as water (H2O), ammonia (NH3), hydrogen gas (H2), methane (CH4), and other mineral salts—the scientists subjected the mix to a continual electrical discharge (essentially to simulate lightning strikes). After about a week into the experiment, four major organic molecules in their simplest forms were generated: nucleotides, sugars, fatty acids, and a total of five amino acids—all thought to be the precursors to life. In the Miller-Urey Synthesis experiment chemists Stanley Lloyd Miller and Harold Clayton Urey simulated what conditions on Earth might have been like four billion years ago. The result was that chemical substances essential for the formation of life were created.